Uscom BP+ is the premium clinical and research tool for hypertension. Using SupraSystolic Oscillometric technology with a direct physics based algorithm delivers validated central Blood Pressure and the most physiologic and detailed central and brachial pulse pressure waveforms. 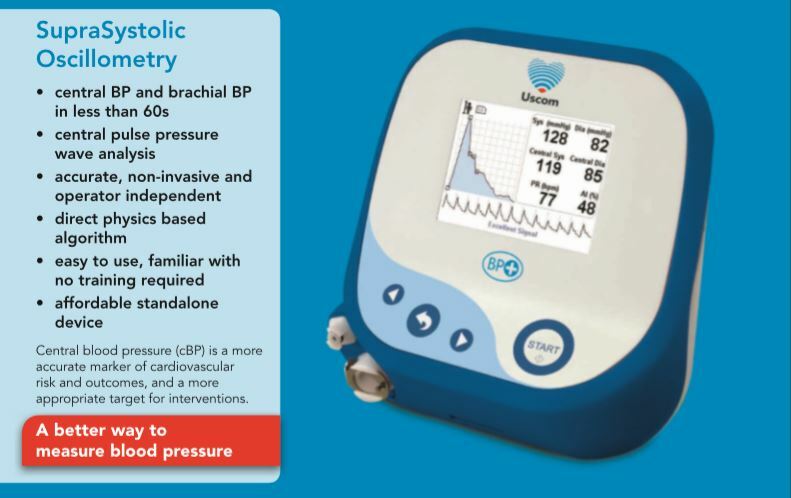 Uscom BP+ pulse pressure wave parameters include systolic and diastolic aortic and brachial pressures, arterial stiffness measures, and rhythm strip. Repeatable, accurate, affordable, standalone, non-invasive and operator independent, one button simplicity, measuring both central BP and brachial BP easily and consistently in approximately 60s. BP+ uses familiar clinical practice to provide personalized risk assessment and treatment. Hypertension. Outcomes. Innovation.